In the freight and transportation industry time is often of the essence and new cost-saving methods are welcomed with open arms. The Sydney Freight Logistics Optimisation Workshop (FLOW) is a must see event for anyone interested in improving their current freight and transportation methods, particularly farmers who regularly transport stock and/or crops. Attendees will have the opportunity to learn from some of the industry’s best applied researchers and practitioners via a range of informative and insightful tutorials, discussions and case studies. Most of these specialists spend their days formulating more effective planning and operational procedures for the freight and transportation industries, and are thus bound to offer a wealth of advice. The one day event will run on Friday, November 16 from 9.30 to 4.30 at the CSIRO Life Sciences Building in Ryde. While this workshop will be invalaluable, it is also important to ensure you have the right freight and transportation equipment on hand to begin with. For example, farmers who require that their crops and fertilisers be transported in a safe, efficient manner should consider Duraquip . The company’s Tornado range, which comprises multi-compartment trailers in various models, is particularly noteworthy. Available in 2 compartment, 3 compartment, 3 compartment (short) and 2 compartment liquid models, the trailers are perfect for transporting seed and fertiliser, however they can also be used to transport other crops from farms to the marketplace year round. 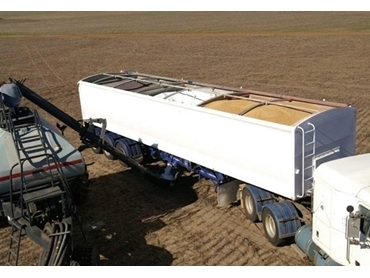 Thanks to their large size and reliable nature the trailers are of particular use during harvesting and seeding time as they eliminate the need for farmers to work in close proximity to their storage bases, instead allowing them to create one centralised storage base to work from. Seed and fertiliser can subsequently be transported at a much fast raster rate, which means farmers enjoy enhanced efficieny during the often stressful harvesting and seeding season. So now there is no excuse. If you wish to improve your current freight and transportation methods, the FLOW workshop is bound to be worth your while, meanwhile updating your transportation equipment can be equally beneficial. To find out more, why not check out the Duraquip website and view the company’s extensive range of quality, competitively priced trailers.